With the recent passing of my Mellow, I’ve been thinking a lot about how pets enrich our lives and become members of our families. There are so many benefits for children to grow up with pets, but some people worry that pets will hurt children because of old wives tales. Others find caring for pets and children together too stressful and then the pet ends up at the shelter. It’s not uncommon to hear stories of people surrendering their pets because there is a baby on the way. The good news is that you don’t have to give up your pet. 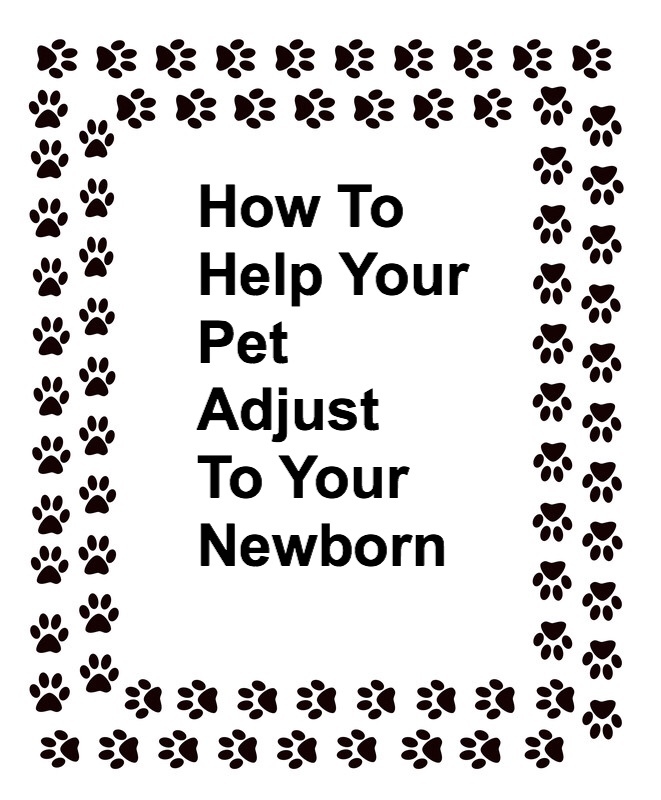 Here are some ways to help your pets and newborn happily coexist. While you are preparing for your new baby, so are your pets. In fact, they might even know you’re pregnant before you do. I’m pretty sure Diamond and Mellow knew as they became quite clingy and protective around that time. It’s best to prepare your babies room a couple months prior to your baby coming home if possible. I wasn’t sure if I would be able to do this since I was house hunting during my pregnancy, but luckily, I found a place in time. Rosebud was due in December, so I had all the furniture in her room by October. This was so that Diamond and Mellow could get used to the furniture. They could put their scent on it. Cats like to rub on things to mark it as their own and the furniture in Rosebud’s room was no exception. They could learn what was off limits. They could sit in her chair, but the crib was a no-no. 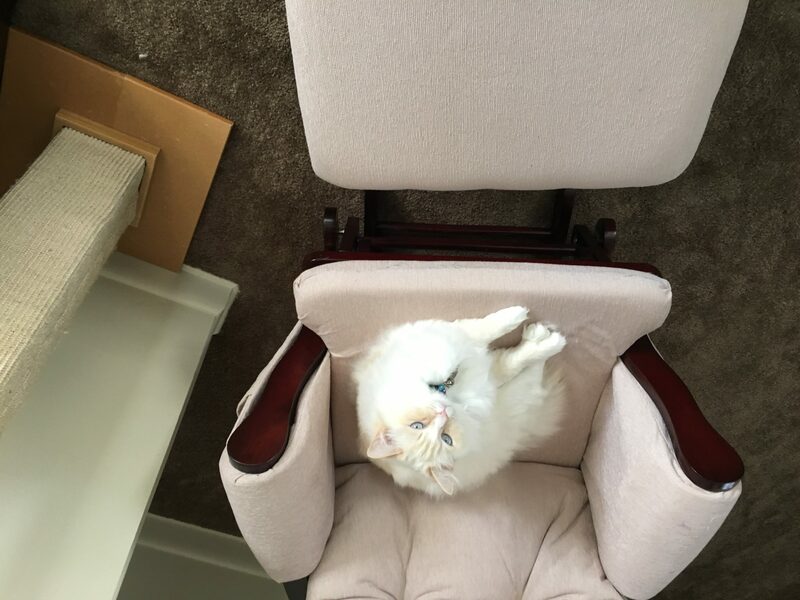 Mellow found her chair right away and decided it was his. As a side note, you can leave out bottles of powder, baby wash etc so that your pet gets used to those smells as well. Before your baby is born, pretend you already have the baby. At different times, put on sounds of a baby crying. Put a baby doll in the crib, carry it around etc. this may sound silly and I’ll admit, I didn’t do this. Of course you can’t always predict how your pets will react, but I knew Diamond and Mellow were pretty low key. I never worried about agression or any extreme stress reactions. If you have an extremely sensetive pet or if you have any concerns that your pet will react negatively, I would recommend doing this just to gage your pet’s reaction if nothing else. Several years ago, I listened to The Pet Show with Warren Eckstein and he always recommended this method for both dogs and cats. If you are the mother to be and you are the primary care taker for your pet, have someone else step in if possible. 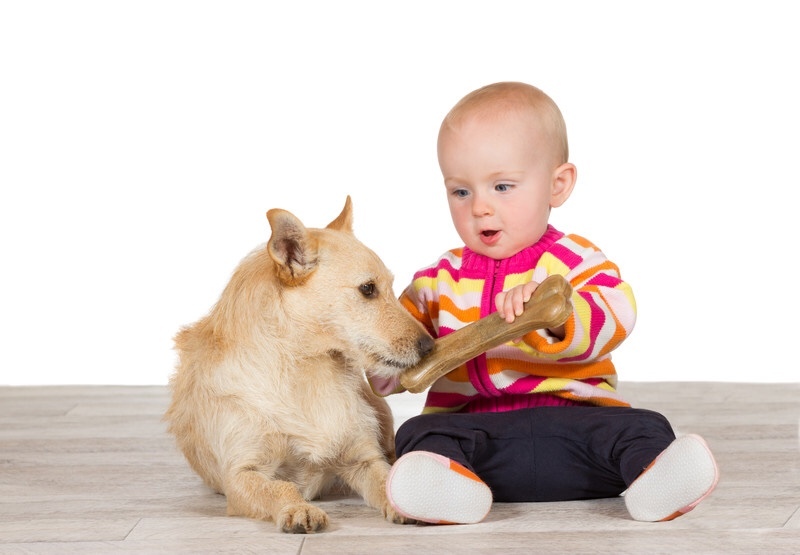 This way your pet will get used to a new routine and will not feel so lost when the baby comes. Maybe your partner can feed the cat and change the litter box. Maybe another family member could take the dog for a walk or play a game of frisbee. 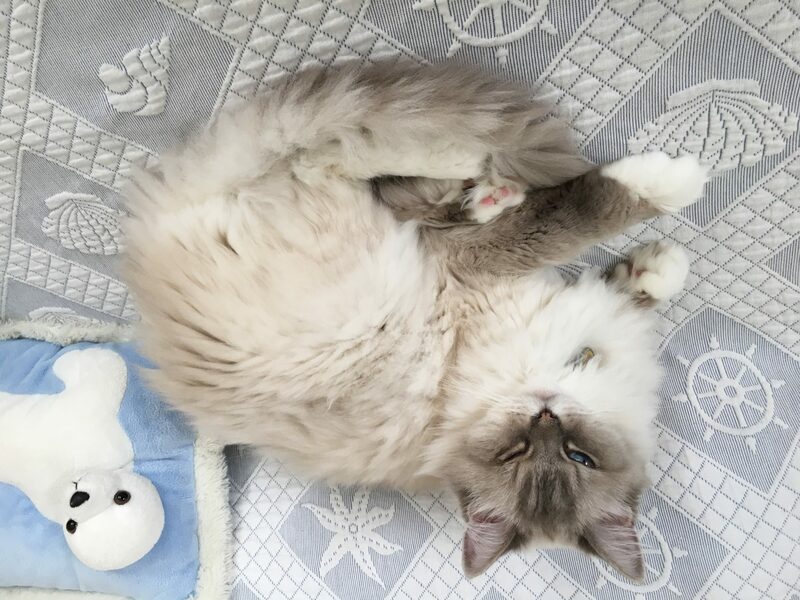 Although no other family members lived with me, they gave the cats more attention when they did visit because they knew the cats might feel jealous of the baby. Slip in a few extra treats or a special toy. Anything that makes your pet feel loved. After the baby is born, have your partner or other family member bring home something with the baby’s scent on it. It could be anything. A blanket, a towel or even a piece of clothing. Put it near a place where your pet likes to hang out. 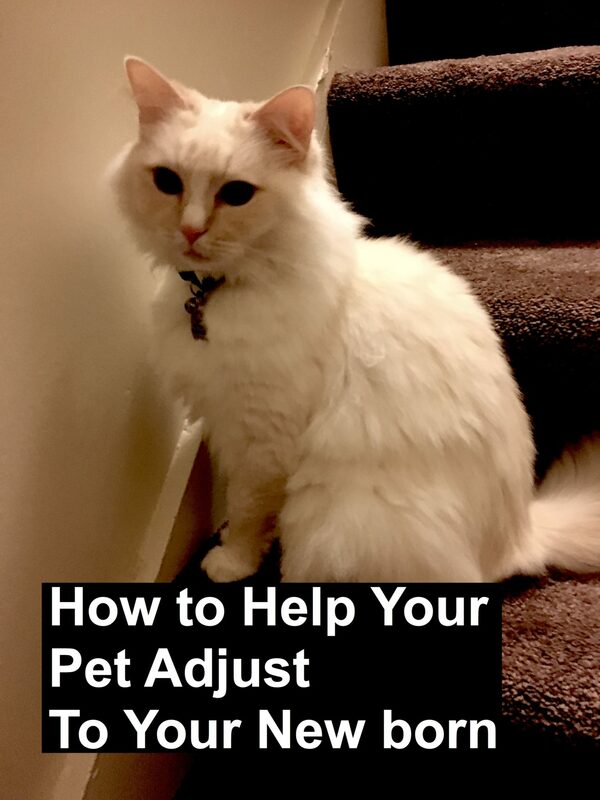 It could be near your pet’s bed or favorite scratching post. I had every intention of doing this, but my hospital stay was so stressful that it had slipped my mind. I wasn’t that worried about my cats with Rosebud, but if your pet is really sensetive, I’d highly recommend it. 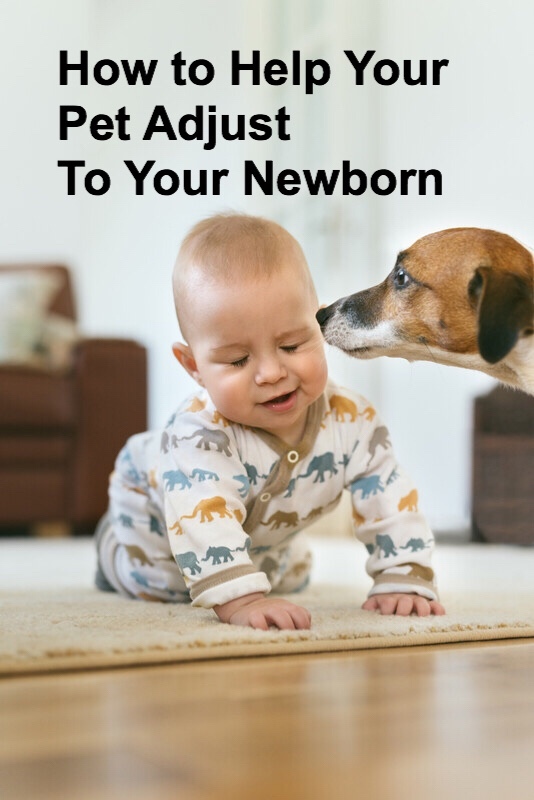 If your pets have already smelled your baby’s scent, they will feel more comfortable once your baby arrives home. When I first set Rosebud’s car seat down, diamond and Mellow quickly came to investigate. They sniffed, rubbed against the car seat and got back to napping. Now that your baby is home, you need some separate spaces. Make some baby free and pet free zones. I’d recommend investing in a couple of good quality gates. In my house, the crib was the pet free zone and at first, my bed became a pet free zone as well. I was worried that Diamond would get too close to Rosebud while she was sleeping. She loves to snuggle at night. The room with the litter box was a baby free zone. I had gates set up so the cats could get through, but not Rosebud. I also have one high cat tree so the cats can survey all the action from above when they want to get away. For a dog, the separate space might be a crate or a gated room. This is common sense, but never leave pets and babies unsupervised. This cat tree is similar to an older one I had. This is perfect for a multi cat household. I have had other cat trees as well. Scroll down to the end of the post if you are interested in other models. As stressful as new motherhood can be, try to take a few minutes each day to spend quality time with your pets to remind them that they are a member of your family. They haven’t been replaced by the baby. I definitely couldn’t spend as much time playing with and pampering the cats, but I took time every day to pat them. They’d usually come over and lay next to us if Rosebud played on the floor. After a while, they started sleeping next to us at night. I’d get my cat snuggles at three AM after a nursing session. I was so peaceful being up in the early hours of the morning, just listening to the quiet and snuggling with Diamond. Mellow was more demanding and was more in my face during the day. He’d come lay in the middle of Rosebud’s toys and become involved in her play as she got older. Sometimes you have to take your pets lead, spend the time when you can and eventually your baby will become interested in your pet as well. Now Rosebud helps me feed Diamond. She tries to play with her using the cat toys and she has learned to be gentle with her. Diamond has always been protective of Rosebud since she was born, but Rosebud developed a bond with both cats. It’s been amazing to watch. With the benefits to Rosebud, the preparation was worth it. Both for the cats and for her. 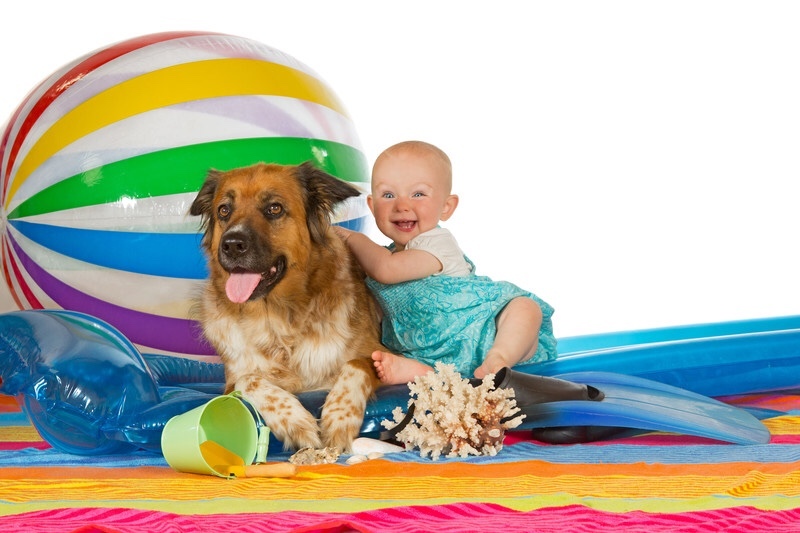 How are your pets with your baby? What have you done to help them adjust? Tell me in the comments. Oh, that’s sad. At least your cat is still apart of your family, but you live and learn. My cats were such a huge part of my life before my baby that I couldn’t imagine giving them up. I was having a hard time and they were my only real comfort, but there were mistakes I made in the past regarding some of the pets I’ve had. All we can do is do better next time and do what we think is right. Thank you for your comment.